Huge Savings Item! Save 11% on the Prodyne Iced Appetizers by Prodyne at Amina Restaurant. MPN: IC-50. Hurry! Limited time offer. Offer valid only while supplies last. A chilling combination of stainless steel and acrylic, this Iced appetizers tray brings high design and impressive stay cold function to the party. A chilling combination of stainless steel and acrylic, this Iced appetizers tray brings high design and impressive stay cold function to the party. High quality 18/8 stainless steel 2 compartment upper food tray rests on top of thick acrylic bottom ice tray. Place cubed or crushed ice in bottom tray and position upper food tray above, pushing it down so good contact is made with the ice. The upper stainless steel server gets very cold with the ice below and keeps the food chilled for hours. Great for indoor or outdoor entertaining. 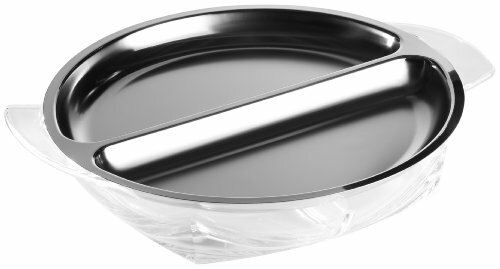 Grafco 3261 Flat Type Instrument Tray, Stainless Steel, 13-5/8" x 9-3/4" x 5/8"